It's less than a month until Oprah and Gayle head out on their most excellent adventure of their first cruise to Alaska. They will be taking along a whole boatload of their friends aboard Holland America's Eurodam (for a price, of course). Among those friends will be some better friends of Oprah's who are wealthier and brighter than the rest (because they get to go for free), and they will be telling the other friends how to have better lives (but not as good as Oprah's, of course). Oprah's magazine, O, has just finalized the list of Oprah's friends who will be going (for free) and letting everyone in on the secret of how to live better or telling everyone what it's like to work for O behind the scenes. A couple weeks ago, Symphony of the Seas was floated out of the dry dock at STX France in Saint-Nazaire, which means the construction phase is completed. They are now in the finishing phase, and Royal Caribbean has released a new video where some of their executives talk about the continuing work that will go on at the yard. This story appeared in the June 23 edition of Cruise News Daily. The crowded luxury segment of the cruise industry got a little more crowded today when Ritz-Carlton decided to move from hotels into cruises with a line they are going to call the Ritz-Carlton Yacht Collection. 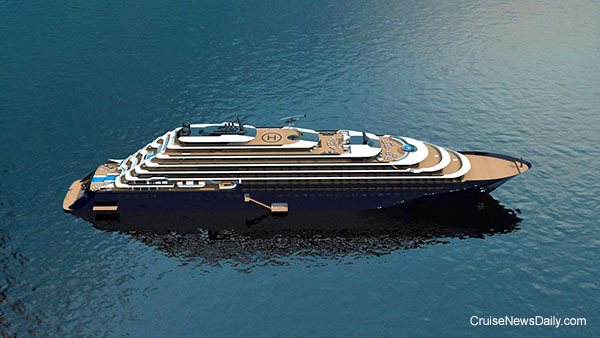 Rendering of one of three ships for Ritz-Carlton Yacht Collection. Rendering courtesy of Ritz-Carlton. All rights reserved. May not be copied or used without express permission. Even though it was delivered back in January and entered service at the end of February, Viking Ocean Cruises' third ship, Viking Sky, was christened today, on the Summer Equinox in Tromso, Norway. The port is north of the Arctic Circle, and that, of course, allowed the ship to be christened under the Midnight Sun. P&O's newest ship, Pacific Explorer, arrived in Sydney on Monday, but until (Wednesday evening - Thursday morning in Sydney) no one knew the identity of her godmother who will her on July 2. Who more perfect than another explorer? Like, Dora the Explorer? International basketball stars Yao Ming and his wife, Ye Li, will serve as inaugural cruise ambassadors for Princess Cruises in China and will officially name Majestic Princess. The naming will take place in connection with a gala celebration for the ship in Shanghai on July 9. Seabourn released most of their 2018/2019 fall/winter programs, and Seabourn Ovation will be heading to Asia. Three crew members from Norwegian Escape were arrested by Belize authorities when the ship was at Norwegian Cruise Line's new private island, Harvest Caye, last Tuesday, according to 7 News Belize. The three men are alleged to have two kilos of cocaine on the ship and for drug trafficking. Brilliance of Seas is in hot water in Spain. The ship made an overnight call at Ibiza last Thursday, and they had a deck party, but the volume got a little out of control according to the police - and the Coast Guard - and the port authority. It got so loud during the night, the neighbors across the harbor called the police. Have You Always Wondered What Mermaids Drink? I'm going to have to get a better calendar. This was National Martini Day, and my Google calendar didn't inform me. It's lucky Carnival Cruise Line did or I wouldn't have known about the Mermaid Martini they created for the occasion. The recipe appeared in the June 19 edition of Cruise News Daily.